After I realized that the Brief Firefox add-on was - at least partially - responsible for the high cpu and disk usage of Firefox every 45-60 minutes I had to find another way to read RSS Feed. I uninstalled the Brief add-on and did face the problem that I had to export all Firefox Live Bookmarks as this was what Brief used to display and update feeds. Update: While the article refers to Firefox 3, the same method works in all recent versions of the web browser as well. There was unfortunately no option in Firefox 3 to do that. I was able to export all bookmarks to html and json format but that did not help me as Feed Readers were only supporting the OPML format. If you cannot find an option in Firefox you can be very sure that some add-on developer has already developed a solution. 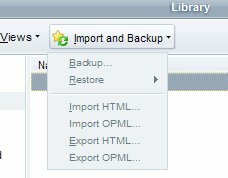 In this case it's the OPML Support add-on which adds the option to import and export opml files directly to Firefox. OPML files contain the RSS Feed information and can be imported into virtually any RSS Feed reader. It can export Live Bookmarks, regardless of whether they have been used by a feed reader like Brief or directly in the browser. The two new options are added to the Bookmark Manager which you can open with the keyboard shortcut Ctrl-Shift-b. Both are available under the Import and Export menu. It takes some time to export the Live Bookmarks and Firefox will not be responsive during that time. The result is an opml file on the local drive that you can import into most feed reading services and desktop applications. It is naturally also possible to use the extension to import an opml file into the Firefox browser if you want to use one of the available feed reading extensions or the browser's own Live Bookmarks capabilities for that. I tried using the FF3 OPML support addon but after waiting for 2 or 3 minutes with no apparent activity (no output file had been created according to the windows file explorer) I closed the addon dialog which also closed FF. I have several dozen live bookmarks I want to remove from FF and load into Opera or some other RSS reader because when I load FF it is unresponsive and hogs the cpu for over 30 seconds, (and I have a fast dual core system). At this point I’m wondering how long I should wait for FF to complete the live bookmark export… 5 minutes? If you don’t mind my asking… how many live RSS bookmarks did you have, how fast is your system, and how long did it take for the export operation to be completed? Mike I really cannot remember how long I waited but it was more than just 2-3 minutes. My system uses a brand new Wolfdale cpu and 4 gigs of RAM. I had 160 Live Bookmarks at that time. Thanks for the quick reply and the info, I’ll try again and wait longer. Nice system you’ve got there! I tried again, waited 23 minutes, processor at 50%, no file. Restarted FF, processor at 1% so I guess it was doing something, I’ll try again when I can let it sit for an hour or more, I’ll let you know what happens. Martin, after about half an hour the file was written, worked perfectly. Thanks for your post, I would have given up otherwise. For everyone else out there, if you’re patient this addon works great. Thanks for the information! I didn’t want to spend hours doing it by hand.